It may be small. It may just be a cheap imitation, but when I look at it I see all the hopes and dreams of all the years as they are told in the story of stories. No more ghosts visited me in the night, but just like Ebenezer Scrooge, I woke up knowing just what I had to do. You see Scrooge wasn’t the only movie that my brother and I used to watch. Alan was particularly fond of science-fiction movies. Sometimes, when he would manage to convince me to watch one of this movies with him, I would complain after just a few minutes in, that the premise was just too unbelievable; I mean really nothing like that could ever actually happen. Alan would remind me that you don’t have to believe them; you just have to watch them, go with the story, see where it takes you. When you really think about it, many of our best-loved stories never actually happened the way we tell them. Take Scrooge for example; does any one of us actually believe that Ebenezer was really visited by three ghosts? We know that it is a story that never actually happened the way it has been told to us; and yet it has the power to take us somewhere, to move us as we watch the incredible transformation of old Scrooge and we too are moved to keep Christmas well. One thing I do know for sure, is that you can tell if a story is any good; if its taking people somewhere, or if its moving them, or transforming them – simply by how often the story is told. Really good stories, like the stories about the birth of Jesus have not only been told over and over again for generations reaching back some 20 centuries, these stories have been told in scared places on holy days. The stories of Jesus’ birth have been elevated to the category of myth. Please don’t make the mistake of thinking that myths are not true. On the contrary myths have the power to communicate truth. A myth is only untrue when it is presented as a fact. Myths are so much more than just mere facts because myths have the power to tell us the truth about the deepest mysteries of life. Myths are metaphors about the very stuff of life and they have the power to help us to understand what it means to be human. Joseph Campbell who spent most of his life studying the myths of the world defined myths as metaphors about human life. It may appear that myths only describe great external events like the creation of the world, or the union of the human with the divine, or a miraculous birth, an heroic act, or an against all odds struggle, or a tragic death or a mysterious resurrection. According to Campbell, myths derive their power to communicate truth because they are really stories about the things that go on inside of us; in here, right now, rather than “out there” somewhere in the distant past. “Myths are stories of our search through the ages for truth, for meaning, for significance. Deep inside, we long to understand the mysteries of life and relationships both human and divine. On a good day, most of us are functioning at a conscious level and carry around with us baggage that we usually manage to confine to the realm of our unconscious self. Stored within our unconscious self are all our personal memories, our experiences, our desires, our fears, our urges, our compulsions and our deepest longings. Jungian psychologists would tell us that in addition to our personal unconscious self, each of us is also deeply connected to what they call our collective unconscious. Our collective unconscious is the place where the baggage of the whole human race resides. Carl Jung described the collective unconscious as our “collective closet”. According to Campbell, myths are born in the deepest realm of our collective unconscious. The actual contents of our myths are different from one culture to another; but some of the same fundamental motifs that deal with the mysteries of birth, life, death, and certain forms of rebirth and renewal run through the great myths of the world. The difficulties with myths occur when we get hung up on believing in them as facts. When we refuse to look beyond the metaphors to see the truth to which they point. It’s kinda like standing in front of a painting. We don’t stand there and ask is this painting true or false? Did this scene really happen? These kinds of questions miss the whole point of the artist’s work. We need to approach myths in the same way as we approach art. Does this painting touch me? Does this music move me? Does this movie inspire me? How does this work of art change the way I think about life? Great myths like great art move us, touch us, and transform us in the deepest realms of our being. I believe that the stories about the birth of Jesus have been told over and over again, on holy days, in sacred places for 20 centuries precisely because they tell us something about our God and ourselves that has the power to transform how we live in the world. In the stories of Jesus’ birth we learn that our God is intimately involved with the stuff of life. In the stories of the child born in Bethlehem, we learn that our God is born among us and dwells among us. And so on this Holy Night: we declare that long ago, a child of questionable parentage was born under very precarious conditions, born to homeless wanderers, in a place fit for animals. Tonight we declare that this strange birth had cosmic dimensions. The night skies lit up, celestial voices and songs were heard by nearby shepherds; why even the planets aligned themselves so as to attract the attention of far off astrologers. Tonight we proclaim that this child born in poverty, in dangerous times, under such precarious circumstance is also Divine. We have the audacity to proclaim this because of all that we have seen and heard in the life and teachings of Jesus of Nazareth. The stories told about Jesus’ birth could only become myths because the people who first crafted these stories had experienced the power of the life and witness of the Man Jesus. We know that this Jesus proclaimed a message of justice, love, and peace. We know that Jesus taught a radical new understanding of the nature and character of our God who is LOVE. We know the LOVE of God because Jesus lived that LOVE in his very being. No matter what the people did to Jesus, he loved them. No matter what they said to him, Jesus loved them. Jesus was denied and Jesus loved those who denied him. Jesus was betrayed and Jesus loved those who betrayed him. Jesus was forsaken and Jesus loved those who forsook him. Jesus was tortured and Jesus loved those who tortured him. Jesus was killed and Jesus loved those who killed him. With his life Jesus personified the Love of God. And so, when the people came to tell of this amazing life, they remembered him in the way that their neighbours always remembered exceptional lives and they cast a star in the sky, described an incredible union between the human and the divine, and a birthing filled with challenges, and set the whole thing to music sung by a celestial choir. Each one of us has a deep desire, a hunger, a longing to be born in a whole new way, and tonight, Christmas Eve, the story of Jesus birth, declares that we can be born to a new level of awareness. For tonight Christ is born in us all. The stories of Christmas are not about miracles. The stories of Christmas are not concerned with facts or reason. The story of Christmas is about the love of God interacting with human life to create in human life wholeness, the ability to live fully, the capacity to love extravagantly, the courage to be everything that we are capable of being. The story of Jesus birth points us toward the truth that lies in the power of God in Christ that enables us to live and love and to be. Jesus of Nazareth lived a God-filled life, a life committed to love. The power of the myths surrounding the birth of Jesus opens our hearts to the possibilities of living our lives filled with the love of God. Because the truth that the Christmas story points to is the very real possibility that each and every night a child is born is a holy night. 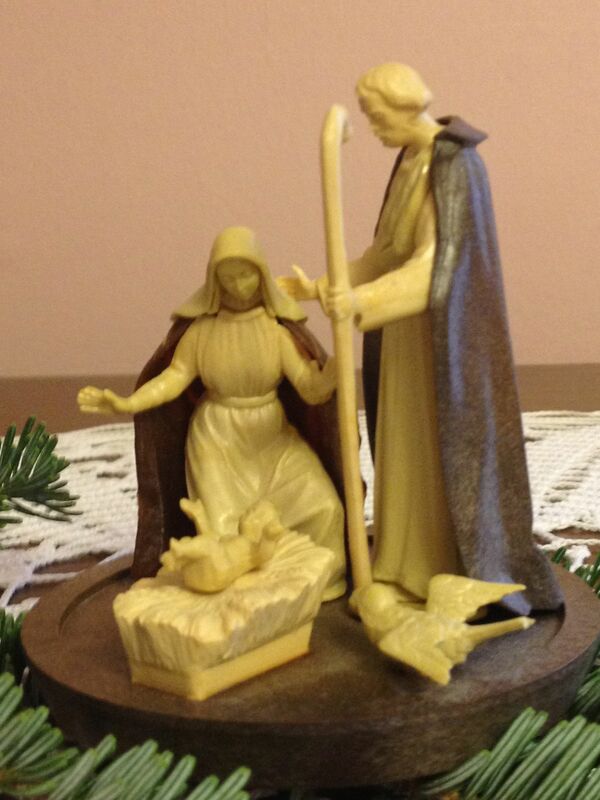 The story is so powerful, so true that even a small, cheap, plastic, nativity scene can move us beyond ourselves to the heart of the story where we are too can awaken to the reality of our God who is Love. By embodying the LOVE of God, Jesus of Nazareth changed the world. The stories of the birth of Jesus remind us that we too are called to embody the love of God. We are all born with the power and the potential to touch our world in such a way that it will be a more just and humane place for our having been here. On this holy night, dear sisters and brothers, may Christ be born in us all. This entry was posted in Bible Study, Evolutionary Christianity, Progressive Theology, SERMONS and tagged Advent reflection, Christmas Eve Sermon progressive christian, emergent theology, evolutionary christianity, Joseph Campbell Christmas, progressive Christian Christmas Eve sermon, progressive Christian Christmas sermon, progressive Christian sermon Luke 2, progressive christianity, progressive theology, spirituality by Rev. Dawn Hutchings. Bookmark the permalink.